rem: Bonjour, Madame, bienvenue. I’m delighted to have you on my blog today. PEARL: blushes I think you, Madame. I’m most happy to be here. rem: Yours is quite the bittersweet story. What can you tell us of your suffering? PEARL: Oh, Madame, it was most difficult. I truly believed that I didn’t deserve to be happy. PEARL: touches her hand to mine I know you have fought the same demons. rem: nods And now you are living a most happy life, n’est-ce-pas? PEARL: Oh, oui! I most surely am. rem: What can you tell us of Simone? PEARL: shakes her head Such a tomboy, that one. Never did she prefer tea parties—unless they were outdoors. And always climbing and tearing her dresses and stockings. But she is a dear, and a dear friend. Never did she turn away a friend in need, and never did she know anyone who wasn’t instantly her friend. rem: What impact did it have on you when she fell? PEARL: La! Madame, it was most horrific. We were all little girls still, we didn’t comprehend what had happened. Only that she fell in the water and… gasps … and she never came up again. rem: Pearl, I’m so sorry you saw that. PEARL: Merci, Madame. We all vowed never to go there again. Mercedes and Scarlett and myself. It was too difficult, too painful to play there ever again. rem: And where was that? PEARL: Versailles—well, we called it that. Truly, it was a burned out old church. rem: You were the one who thought to name it ‘Versailles,’ correct? PEARL: Oh, oui. I visited there—the real place, the one in Paris—when I was a small girl. rem: I believe you have become a midwife, is that correct? PEARL: Oh! Oui! And I am so happy in that. rem: Toutes nos félicitations! Congratulations. It was a struggle for you, was it not? rem: But not because of difficulty. rem: I understand. You fled Saisons. Can you tell us why? PEARL: I… looks about the room It was… I felt I had no choice. rem: And why was that? PEARL: I believed… I believed my friends would be ashamed of me. That they would no longer want to be my friend. rem: And I believe the answer to that would give too much information away. rem: Dearest Pearl, I’m so happy you visited with us today. And I’m most happy to know you are now happy in your life. PEARL: Oh, Madame. I could not have done it without you. It is I who should thank you. 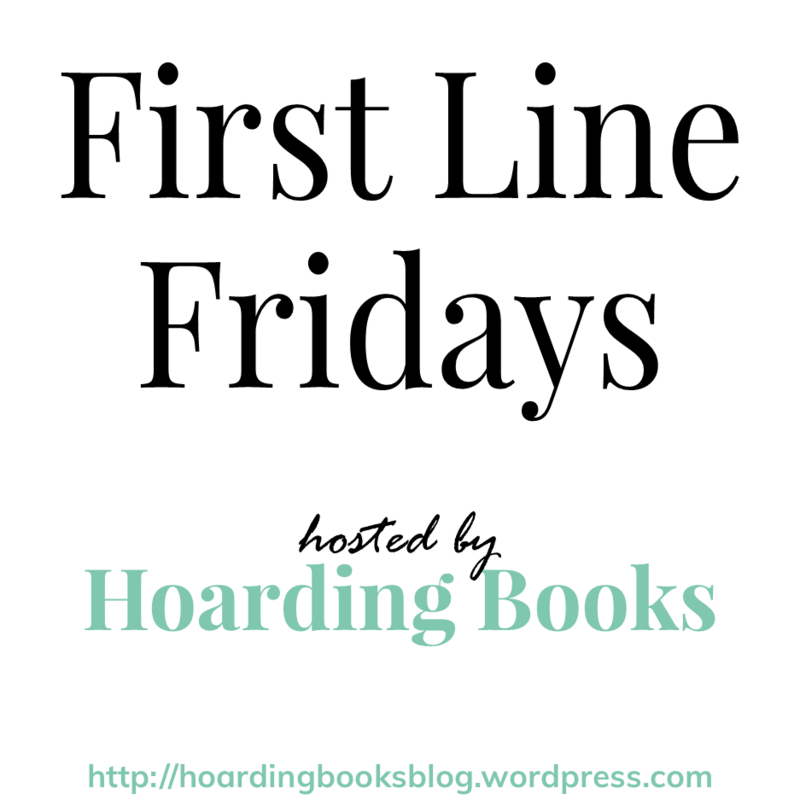 Sarah Van Diest is a writer and editor. She’s the mother of two boys, stepmother to three more, and wife to David. 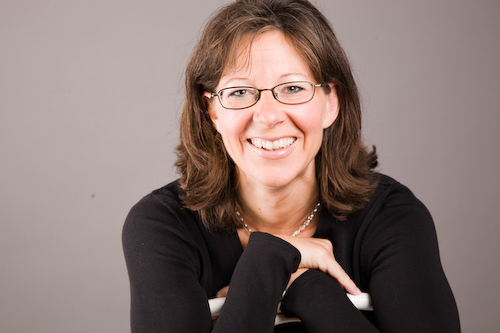 Sarah wrote this book as letters to a dear friend whose life was turning upside down. She’s done this for years for numerous friends, and will continue to, Lord willing. It’s her gift to them. It’s hope written down. It never ceases to amazing me how our heavenly Father speaks to us. To read a devotional that was written not only three years ago but for a personal friend of the author—and that it speaks so directly to my heart—is Father’s providence. Every word in this book is heartfelt and God-felt, and the love radiates on each page, bringing light to dark and wounded hearts. 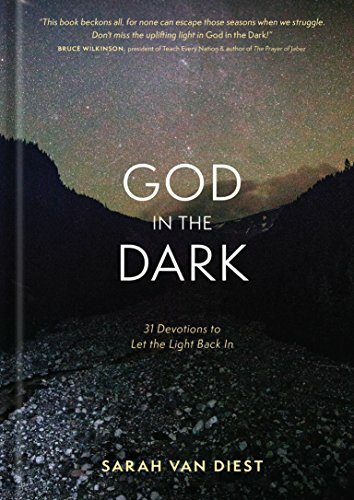 The Word of God is what displaces the darkness, and Ms. van Diest has put together 134 pages of comfort. This is one I can turn to time and again, when the darkness tries to creep in. 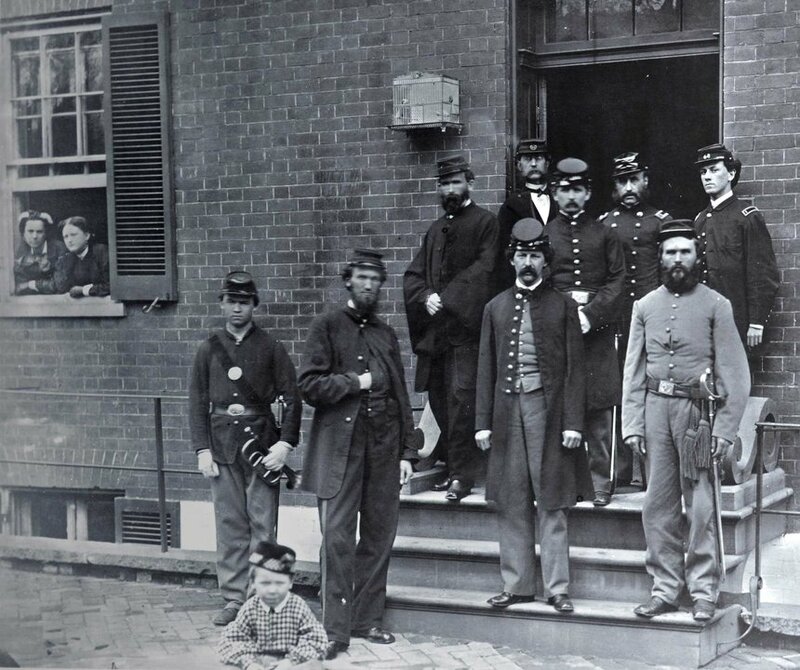 The volunteer nurses of the Civil War. 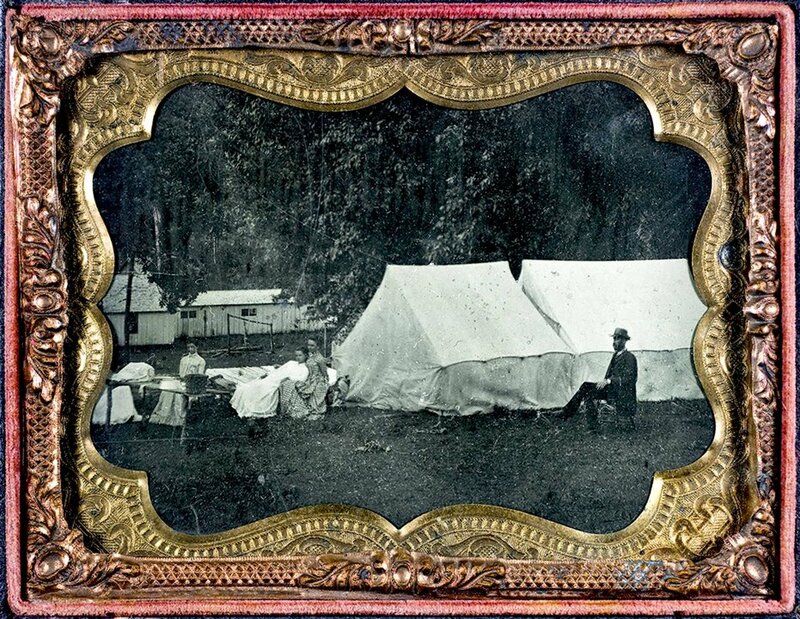 Thousands of women set aside their daily lives to care for the sick and wounded during the Civil War. Women from both sides pinned on aprons and set to work washing, feeding, and bandaging the scores of men who would swarm into makeshift hospitals in their hometowns. At the onset of war, there were fewer than 150 actual hospitals in the country, and no formal nursing schools. The profession was dominated by men, as women were thought to be too fragile to cope with the challenges of caring for the sick and wounded. 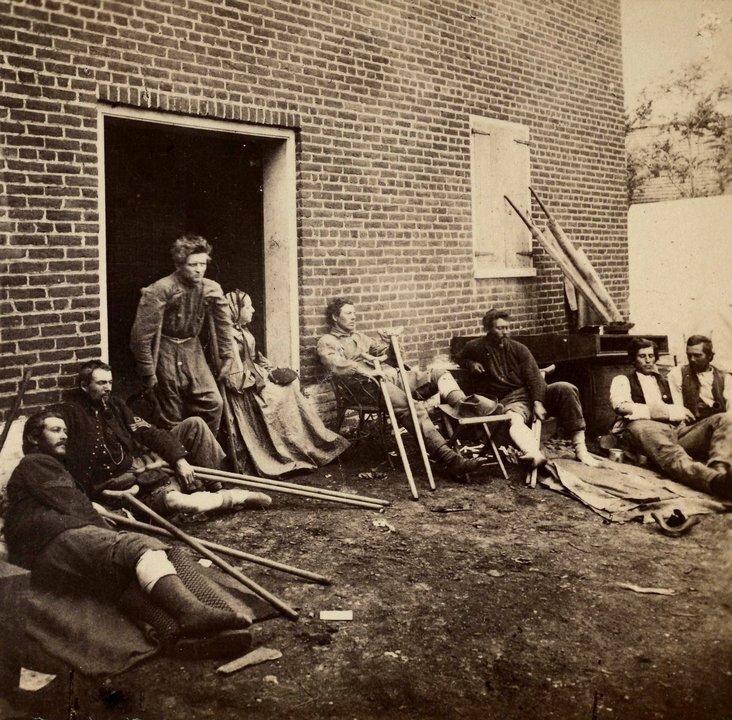 But as the fighting began, the sheer volume of wounded soldiers from both North and South soon overburdened facilities and resulted in a break-down of traditional gender roles in nursing. One of these volunteers, famous novelist Lousia May Alcott records her first days of service in Hospital Sketches. She paints a vivid picture of endless, exhausting work, and gives a glimpse into the nature of the Victorian society with her account of how scandalized both the women and soldiers were when these new volunteers were asked to remove the men’s shirts and bathe them. It wouldn’t be until later when women like Dorethea Dix set up standards and training that things would get a little more organized. But even then, many of the soldiers had to rely on the kindness of local volunteers to help keep them healthy. While some nurses under the direction of Dorethea Dix were paid 40 cents a day plus rations, many were volunteers using shredded sheets from their own homes. 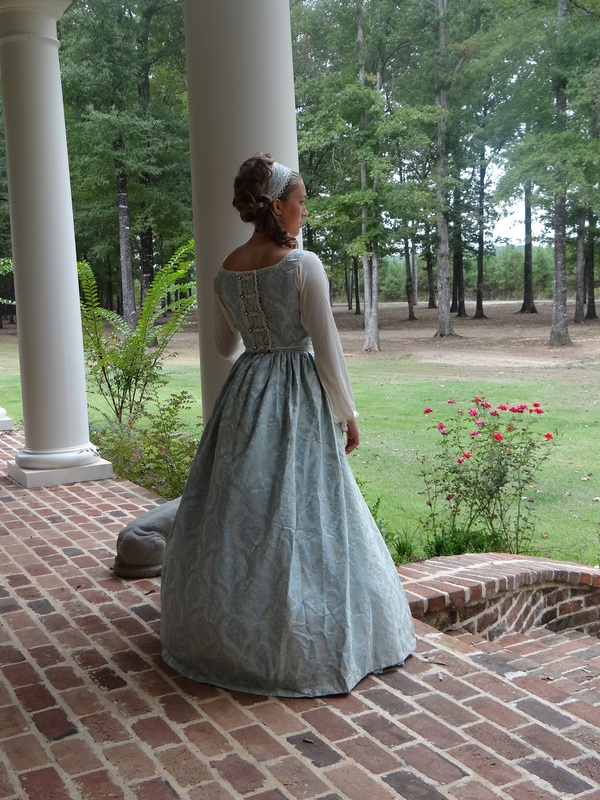 In the backdrop of my Liberator Series, Rosswood Plantation is taken over to serve as a hospital, leaving young Annabelle Ross to learn to tend the men who fill her home. Her duties would have included washing, feeding, changing bandages, writing letters, and trying to keep men’s spirits up. 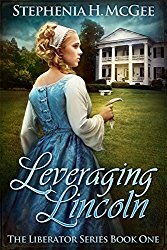 As a Southern lady with Yankee inclinations, Annabelle tries to care for all of the men to the best of her ability, regardless of the color of their uniform. 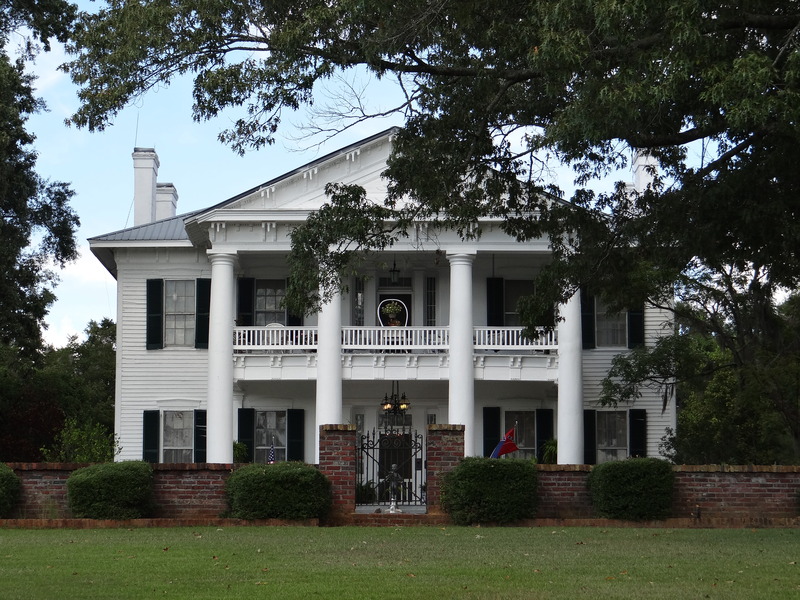 While Annabelle and her time nursing is, of course, fictional, Rosswood Plantation did indeed serve as a hospital for Confederate soldiers during the war. In many cases, mansions like Rosswood were taken over by the armies because of their size and ability to house the officers or create makeshift hospitals, run by army surgeons. The women that lived in these homes often faced a harsh reality as rooms that were once used for parties and balls were now filled with bleeding and suffering men. In a tumultuous time of destruction with a nation pitted against itself, these women found strength and courage to bind the wounds. If not for their valiant efforts and the relentless determination of women like Dorethea Dix and Clara Barton (founder of the Red Cross) nursing wouldn’t be what it is today. 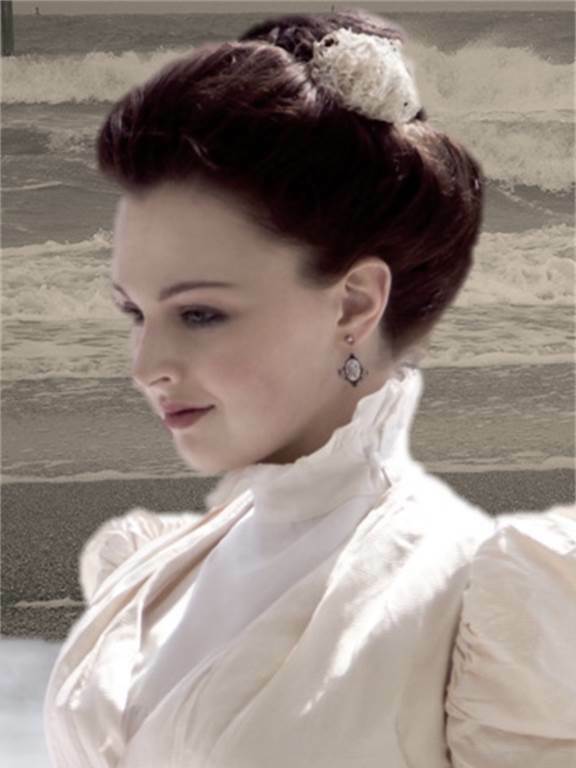 If you are interested in reading more about Annabelle and Rosswood, you can get the first novel in the Liberator Series FREE when you sign up for my newsletter. Get yours instantly here. Let the dead bury the dead, Annabelle thought as the spade sank another few inches into the ground. She paused a moment to wipe the sweat from her brow with a dirty sleeve. Dead, indeed. Her arms were numb from digging, and her back and legs were starting to cramp. A heart hardened against the gristly task beat rapidly with exertion underneath what had once been the gown of a privileged heiress. But, that was before the war, her father’s death and…. Well, it didn’t matter now anyway. 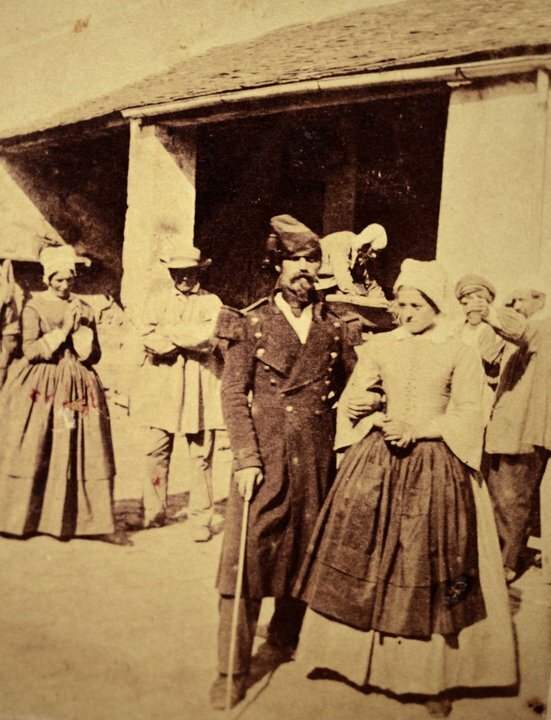 She hadn’t had time for anything other than the soldiers from both North and South who at one time or another had filled her home to overflowing. Annabelle slammed the spade into the earth, her fingers so numb from the cold she hardly noticed the forming blisters. She gave these men the best she could—a too-shallow grave and a few parting words. She recorded every name, should their families ever come to look for them. Until then, Annabelle had no choice but to share her land with the dead. Annabelle looked up from the hard ground and into a face that looked as tired as she felt. The waning light of another long day cast shadows on Peggy’s dusky skin and made her look older than she should have. Peggy lowered the rear legs of the makeshift cart to the ground, giving a soft grunt as she finally released the weight. Annabelle mustered a smile she hoped would soothe away some of the worry lines creasing Peggy’s brow. Peggy hesitated, and Annabelle wondered if this would be the time she refused, but, as usual, Peggy clamped her jaw tight and grabbed the other boot. They heaved and struggled until the body fell from the cart, scraped over the rough earth, and finally landed in the hole with an unceremonious thud just as the sun began to dip below the trees. Annabelle resisted the urge to place her dirty fingers under her nose in a futile effort to hold off the stench. Stephenia H. McGee writes stories of faith, hope, and healing set in the Deep South. After earning a degree in Animal and Dairy Sciences, she discovered her heart truly lies with the art of story. She put pen to page and never looked back. Visit her at http://www.StepheniaMcGee.com for books and updates. “You’re nothing but a failure.” Those words were spewed at me nearly twenty years ago. What’s shocking, though, is that I had lived under that wordless proclamation for most of my life. It’s not true, of course. Although I have failed AT many things in my life—as we all have—that does not make ME a failure. 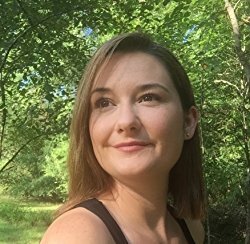 As an author, my characters reflect different aspects of who I am, and in my new release the main character, Pearl, seems to be most like me of all my characters thus far. Though her life was vastly different to mine in many ways, she too lived under a burden of perfectionism—and the plague of never achieving it. This is not Father’s will for us. His standard is excellence, not perfectionism. While I (nor any of us) cannot achieve perfectionism, I can work with excellence. Father God has not put us here to fail. Nor has He made the standard so high or rigorous to make it impossible to succeed. What I’ve learned—as does my character, Pearl—is that all done unto Him, with a sincere heart, He counts as success. Even, and perhaps most especially, when we “fail” by the world’s expectations. When we keep our focus on Father God, when we invite Him into our ventures, even our mundane day-to-day activities, when He is walking alongside us, then we will know success. When He walks alongside us, He directs us, guides us and protects us. And best of all, He whispers in our ear of His love for us, encouraging us and sustaining—and always willing to catch us when we fall. He is for us, not against us. Father God has so much better for me, for all of us, than striving to achieve the impossible. We are His priority, He asks that we make Him ours. And we do that by meditating on His Word, which is to say getting to know Him. And the more we know Him, and more we become like Him. And the more we are like Him, the more we know He is for us not against us. Not even myself. Not even failure. We are made in His image, and He doesn’t fail. And then you come upon a Speck stand, and a sign for Äpfel and because you’ve been in Austria for at least a day, you already know that these are the signs for that incredible smoked bacon and those delicious apples used in the last guesthouse’s Strudel. Step into the time machine, dear reader. Let’s go back to just before the outbreak of World War 1 and illustrate what was happening: the Austro-Hungarian Empire had its reach into a good part of today’s northern Italy, all the way to the Po Valley and Trentino. A good majority of that land also belonged to the autonomous province of Tyrol, who had earned its freedom during the Napoleonic Wars. However, there was quite a group of disgruntled Italian nationalists who held to the belief that the lands to the Brenner Frontier (if you Google this, look just south of Innsbruck) were traditionally Italian. Of course they were: that line of mountains was a wonderful natural barrier against potential enemies to the north. The thing is, Italy and the Austro-Hungarian Empire had little conflict with one another. And in the Tyrolean province, Italian migrants were generally welcomed with open arms. They worked there, lived there, filled in the jobs that needed filling, especially in agricultural labor. All in all, these two cultures worked pretty well together, as well as with the Slavs to the east among a handful of other “regulars”. So what happened? It’s called the Treaty of London. Signed in 1915, the Triple Entente promised huge swaths of land to these Italian nationalists if Italy took up arms against its neighbors and Germany. And there you go. Now imagine Giuseppe and his family work on your Tyrolean farm. He’s called to service. He has to cross the line to the south, pick up his weapon, turn around and face his employer in a war where not one single Italian ever got across into Tyrol. Not one. The battles were all fought south of the line. “IX. A readjustment of the frontiers of Italy should be effected along clearly recognizable line of nationality. X. The people of Austria-Hungary whose place among the nations we wish to see safeguarded and assured, should be accorded the freest opportunity to autonomous development. All very well and good, right? Noble. Righteous. Principally sound, especially if you’re an American. Point 9—especially—was a contentious matter. Imagine you’re Wilson and the French, the Russians and the British come up to you and say, “Emmm…Sir? With all due respect, we’re going to have to ignore those points in the case of Tyrol, south of the Brenner Frontier” as well as a few other places…like Trieste, for example, because there was…well…a secret treaty. Wilson was not prepared to budge on this, so Vittorio Orlando arrived with his delegation and debated about how the Brenner Frontier was absolutely Italian. Naturally! The rivers, look! They flowed from the south to the north. Nobody checked to see if this was true. And it wasn’t. The Italians had fudged the maps. Very simply put, Wilson was in a pickle. Italy was granted the new frontier and the Tyroleans were faced with a cultural pogrom not unlike Stalin’s over Ukraine: the German language and culture were systematically eradicated between 1918 and into the World War 2, with Hitler and Mussolini even creating a pact and demanding the Tyroleans choose either to be Italian or German citizens. Those who voted German, were relocated to new territories. Those who chose Italian, were threatened with relocation to the Italian colonies in Abyssinia. “Wilson himself would later admit that he conceded the territory based on ‘insufficient study’ and that he came to regret this ‘ignorant’ decision.” (Scott A. Berg, Wilson). If World War 2 had not broken out, who knows how things would have turned out. But when Hitler marched into Poland, the whole program was halted. But what of this church? What happened at this lake on the Reschen Pass? The Austro-Hungarian Empire had laws in place that dictated that no man made structure could be built if it affected over a certain percentage of the locals’ livelihoods. Those laws protected the Oberer Vinschgau Valley—the valley where the lake is located—from a plan to raise the lakes of Reschen and Graun by five meters and create a reservoir for the purposes of producing electricity. The plan was reneged. Dead in the water, so to speak, before it could find its legs, because it would have affected too much of the fertile farmland in the valley. But Italy suffered in World War I. They had barely managed to hang onto their britches and one of the first things that occurred was a very strong force that swore that would never happen again. Enter stage left: Benito Mussolini. Italy was in chaos, and after wresting control from the monarchy, he lay out a plan to make Italy the strongest industrial nation in Europe. The race with America began. In order to build machines and technology, you need power. You need electricity. And the new territory of the Alto Adige / Südtirol, or South Tyrol, had a treasure trove of areas for reservoirs and dams. But how do you get around those old laws? Very simply. You write new ones. 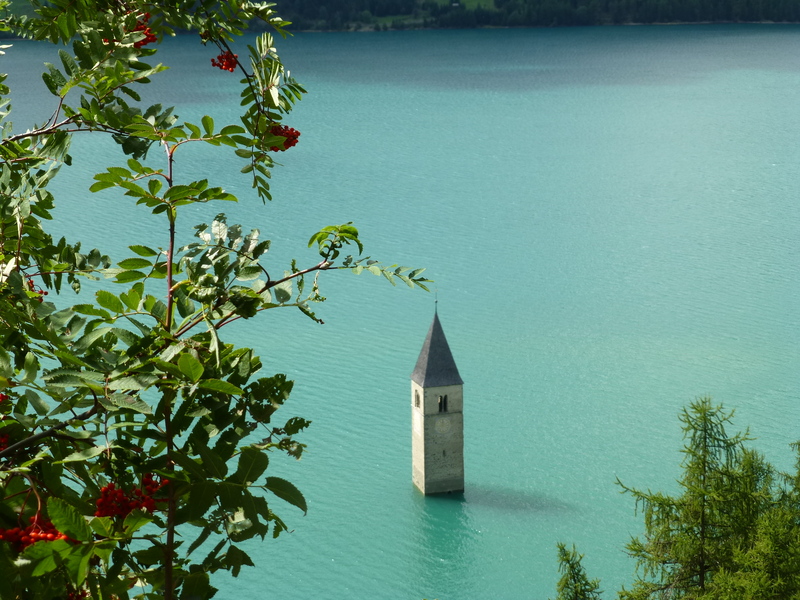 The Reschensee / Lago di Rescia is just one of perhaps a thousand stories about the misdeeds enacted against the German-speaking Tyroleans but the way this particular reservoir was built reads like a thriller. Corruption, greed, and prejudice were the key cornerstones in making this beautiful reservoir happen. Beneath the surface, lie seven villages, wholly and completely destroyed. What arose of this, however, is a story that few know. And really should. My history lessons in school, in Minneapolis, taught me about how important Wilson’s Fourteen Points were, how noble, how righteous, how justified they were. They made me proud to be an American. Isn’t it interesting how, when you travel, you begin to uncover the reality of what we consider to be truth? Isn’t it interesting how, when you look beneath the surface, you can begin to calculate the differences between intentions and actions? 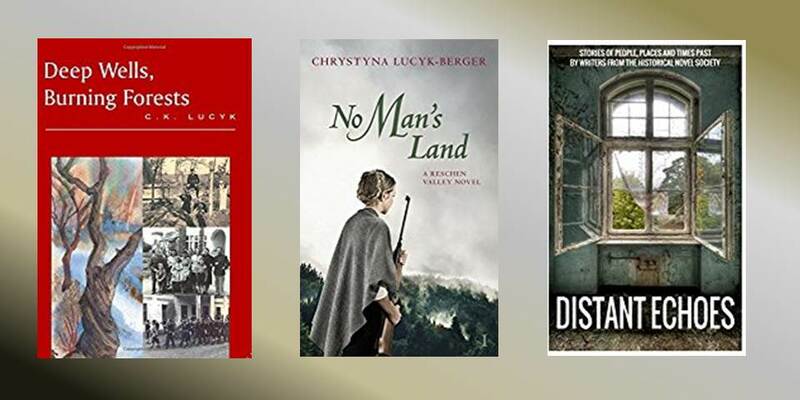 CHRYSTYNA LUCYK-BERGER is a historical fiction author living in western Austria. She grew up in “Nordeast” Minneapolis, first generation to a Ukrainian immigrant family. Her series, RESCHEN VALLEY, uses the building of the Reschen Lake reservoir as the background for her five-part saga. NO MAN’S LAND, part 1, was released in January 2018 and is available on Amazon in Kindle and paperback formats (ASIN: B078WDPDSJ). One step into the massive glass-walled waiting area was all it took. 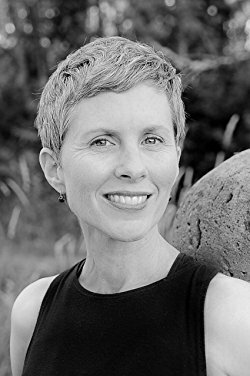 Pepper Basham has been a favorite author since I read her debut novel, The Thorn Bearer three years ago. 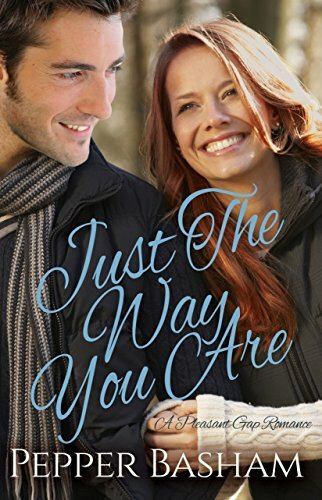 With her signature Britallachian style, and her quirky and sincere characters, I was instantly smitten with Wes and Eisley’s story. rem: Bonjour, Monsieur, bienvenue. It’s lovely to chat with you today. LUC: Swell of you to ask me, dear lady. rem: You’ve been away for a long while. Can you tell us why? LUC: I was doing top secret work. rem: That assignment has ended, correct? rem: And before you took on that assignment, where were you then? What were you doing? LUC: I worked this assignment these past ten years. And as it’s classified, I can say nothing further about it. rem: When you left Saisons, how old were you? rem: And why did you leave? Where did you go? LUC: Dear Lady, I had to leave. LUC: Because I had learned… things. Things a man knows, things I didn’t understand. rem: My apologies, Sir. I know this is difficult for you. Tell us where you went. LUC: Sage. It’s a small town, not ten miles from home. rem: I suspect you kept an eye on your sister. LUC: Indeed I did! I knew what mon père was like. And that Lissette—I’d have killed her with my bare hands if she had dragged Lucy into her debauchery. rem: I can well imagine. And I think I speak for both of us when I say I’m exceeding glad she did not. LUC: It is well for her she never did, yes. rem: Let me clarify for our readers, Lucy is your pet name for your sister, n’est-ce-pas? LUC: nods and smiles Oui. rem: How did you live when you went to Sage? You were a boy when you left. LUC: Hardly, dear lady. I was more man than boy. To answer you, I took odd jobs, picking cotton, toting bales. I made deliveries, took goods to folk others shied away from. rem: Sounds like you were a brave lad. LUC: Not brave so much, ma’am, as necessity. rem: You’ve had quite a fortunate turn of events. LUC: Indeed. My darling is with me again. rem: And you’re recently wed, correct. rem: Congratulations to you both. rem: You are reunited with your sister, as well, correct? LUC: nods I missed her dearly. We always were quite close, even though that horrible woman did her best to keep us apart. rem: Seems you two always made a way to meet. LUC: Indeed we did. Pearl is my sister, my twin, and I’ll not let anyone take her from me. rem: Yours is a most special bond, Monsieur. What was it like when you were little? LUC: smiles We were inseparable when we were small. We played on the swing and when we were older, I walked with her when she’d push her dollies about, and she would watch me when I played ball. When Papá installed the maze for her, we spent our afternoons in the gazebo. rem: And now, you’re reunited. LUC: And glad of it, too. rem: You’re to settle in Saisons, I believe. Is that correct? LUC: You are, dear lady, most correct. rem: Monsieur, I thank you for visiting with me today. LUC: I thank you, dear lady. It has been my great pleasure.